I had the opportunity recently to peruse the samplings of two comic book vendors I don’t normally get a chance to visit, and to rummage through their stock looking for more material for Bible and popular culture resources, and also for the angels in popular culture research project. Down in Wellington, I had a look in at Graphic in Cuba Street just up from the Bucket Fountain. A really good range of new and back issue comics, trade paperbacks and other pop culture stuff. That’s where I found of a copy of the crossover between Daredevil and the Magdalena (see below) a few years back now, and the shop didn’t disappoint this time either. DC Comics’ The Bible (1975) written by Sheldon Mayer, edited by Joe Kubert and illustrated by Nestor Redondo, tackles Genesis 1-19 in a larger-than-life way. 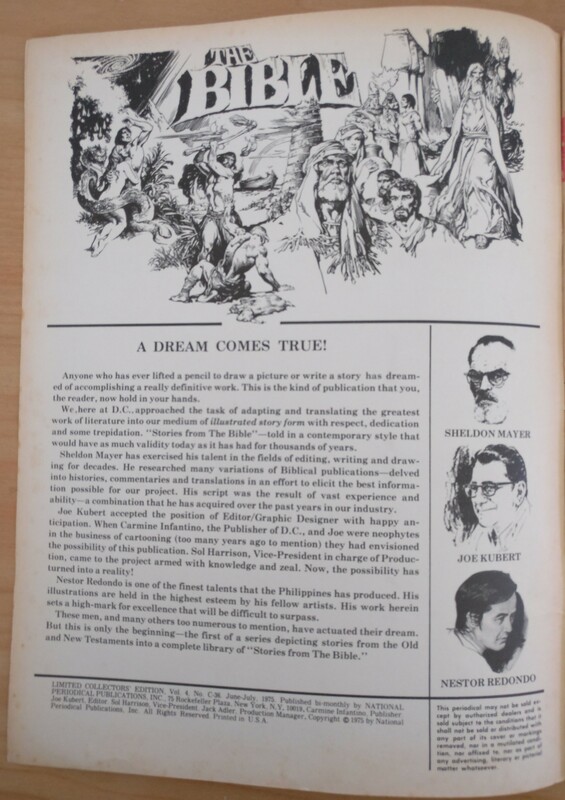 With an audience of children in mind, these “most spectacular stories ever told” in “the most beautiful comic magazine ever produced” (according to DC promotional materials) were aimed at countering the influence of science on children’s religious education. As Davies-Stofka notes this is set up in the first few pages of the comic, but rather than following a creation science agenda, the comics tends more to a more general theistic evolutionism with science providing the ‘how’ and Christian theology the ‘why’ for the world around the reader. What I found particularly striking is how white everyone is in comics. I’ve posted a few photos below, where human ‘perfection’ is equated with blond hair and blue eyes etc. Something for my students to mull over the next time I teach on Jesus in popular culture and translating the Bible into visual media. Here’s the introduction to DC’s 1975 project, which gives some of their (brief) rationale behind the translation. And while, you might say that was 1975, DC Comics also reproduced it in hardcover in 2012. So, all in all, a great start to the New Year. Looking forward to writing up a couple of articles on religion and comics and angels in popular culture on research leave later in the year.